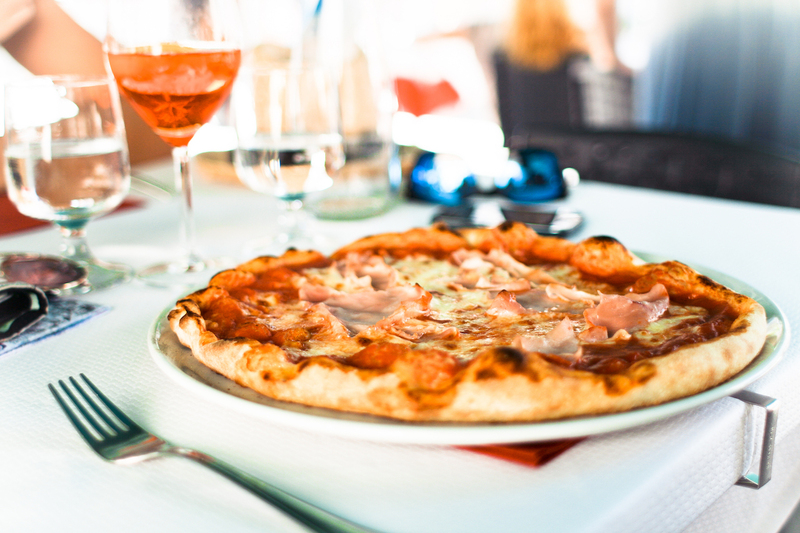 In the Italian gastronomic conquest of America, pizza has been the chief weapon. Is there any Italian dish that has infiltrated our lives as thoroughly as this one? (It’s also a great dish to enjoy with wine.) Unfortunately, pizza has never been a great dish to make at home. One of the things that makes it so good at pizzerias is the high heat is the high heat of professional pizza ovens, hundreds of degrees beyond the capabilities of home ovens. Some years back, the two great chefs who run Al Forno in Providence, Rhode Island, invented a fabulous new pizza that was soon hailed as the best restaurant pizza in America: the grilled pizza. Unintentionally, they simultaneously solved the home pizza dilemma—because the grilled pizza at home, with a good recipe, can be every bit as good as the otherworldly as the grilled pizza in a restaurant! The following recipe has quirks you may find strange, like molasses and the addition of whole wheat flour. But I’m telling you that if you follow this recipe, to the letter and grill some pizza in your backyard, you will be amazed at how fantastic a home pizza can be. 1. In a large bowl, combine the water, yeast, and molasses and stir gently to mix. Set aside for 5 minutes, until bubbly and foamy. 2. Add the salt and 2½ tablespoons of the olive oil to the bowl and stir to mix. 3. In another bowl, whisk together the three kinds of flour. Add the blended flours to the yeast mixture and stir with a wooden spoon until the dough forms a mass and pulls away from the sides of the bowl. Use your hands if necessary to incorporate all the flour…but don’t knead the dough at all. 4. Form the dough into 6 portions. Roll the portioned dough into balls and place them on a well oiled baking sheet. Brush the balls lightly with olive oil and cover with plastic wrap. Set aside at warm room temperature for 40 minutes. 5. Place the tomatoes in a colander and drain. Dice the tomatoes. In a bowl, combine the diced tomatoes, basil, ¼ cup of the olive oil, and the garlic. Stir well and set aside at room temperature. 6. Mix together the two kinds of cheese and reserve. 7. Prepare a charcoal or gas fire. Build the fire so that the coals on one side are very hot (a concentrated mass) and coals on the other side are only medium-hot (a sparser mass). If using a gas grill with dual controls, maintain a hotter temperature and a cooler temperature. Position the grilling rack 3 to 4 inches from the heat source. 8. While the fire is heating, oil your kitchen counter lightly and flatten one ball of dough into a 10- to 12- inch oval, about 1/8 inch thick. It is important to maintain uniform thickness. (Vincent likes to do this by hand, but you might find it easier to do it with a rolling pin, or some combination of pin and hand. Remember: a neat shape is not important, but uniform thickness is!) Continue until all 6 balls are rolled out. 9. Using your fingertips, gently lift one dough (or several doughs, as many as your grill can accommodate) and drape it carefully onto the rack over the hot part of the coals. Within 1 minute, it will puff slightly, the underside will stiffen, and grill marks will appear. 10. Using tongs, immediately flip the dough or doughs onto the cooler part of the grill. Brush with olive oil. 11. 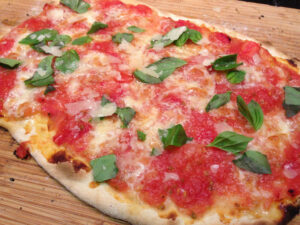 Spread about ½ cup of cheese mixture over each dough, and then dallop each with 8 to 10 tablespoons of the tomato sauce. Do not spread the sauce over the cheese; leave splotchy pools of sauce. 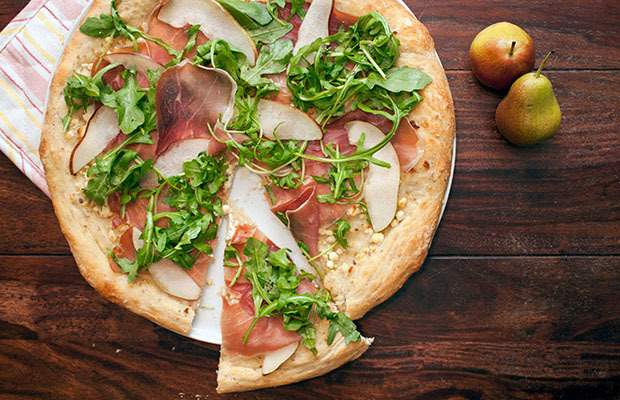 Drizzle each pizza with about a tablespoon of olive oil. Slide the pizza or pizzas back to the edge of the hot section of the grill. Cook for 3 to 4 minutes, until the bottoms are evenly golden brown; make sure not to burn the bottoms. It’s not necessary to cover the grill, but feel free to do so if you’d like the toppings to cook down a bit more. 12. Sprinkle with fresh parsley and black pepper and serve immediately. Repeat with the remaining doughs.